It was literally an out-of-this-world idea that seemed unfeasible when it struck her nearly two decades ago: Made-to-order shooting stars. But Lena Okajima’s audacious project to reproduce nature’s fireworks for mass entertainment is getting ready for takeoff. “The concept dawned on me when I watched the Leonid meteor shower in 2001,” says the CEO of Tokyo-based startup ALE Co., who at the time was an undergraduate student of astronomy at the University of Tokyo. “I knew back then that if I were to launch my own venture, it will be one that produces shooting stars on demand,” she says. Now Okajima’s plan is on the cusp of fruition. Her company, which she founded in 2011, is preparing to light up the skies of Hiroshima with the world’s first artificial meteor shower in 2020. ALE’s business model is conceptually simple but requires exhaustive precision and preparation. Essentially, the company is planning to launch into space custom-made minisatellites equipped with devices that can pump out tiny metallic balls around 1 centimeter in diameter that burn brightly as they fall back through the Earth’s atmosphere. One satellite can carry around 400 of these pellets — whose chemical composition is a closely guarded secret — and the company plans to dispatch anywhere from 5 to 20 for a single event. So far ALE has developed balls that can shine in the colors green, blue and orange at a level just slightly dimmer than Sirius, the brightest star in the night sky. “Even a slight misstep could spell failure,” says Okajima, a 39-year-old mother of two who worked for investment banking firm Goldman Sachs after earning her PhD in astronomy. “The position of the satellite, as well as the speed and angle with which the balls are ejected need to be extremely precise for us to deliver them to where we want,” she says. To create a meteor shower over Japan, for example, the metallic balls need to be released over Australia. They will then travel 7,000 kilometers in 15 minutes before flaring up for several seconds due to plasma emissions at an altitude of 60 km to 80 km. “This precision, as well as the materials we use to create the pellets, are our core technology,” she says. The first satellite is scheduled to hitch a ride into space on a rocket being launched by the Japan Aerospace Exploration Agency by March 2019. The second is expected to follow that summer on a private-sector rocket. If all goes as planned, ALE’s two satellites will be orbiting the Earth by February 2020, preparing for a colorful cosmic shower over the city of Hiroshima that spring. Okajima says when the satellites’ life-span expires after two years or so, they may be used to create giant shooting stars. Like the pellets, the microsatellites are designed to burn up completely while entering the atmosphere, posing no harm to onlookers enjoying the spectacle from the ground. There are also plans to push other used satellites and space debris on a targeted orbit to create artificial meteors. 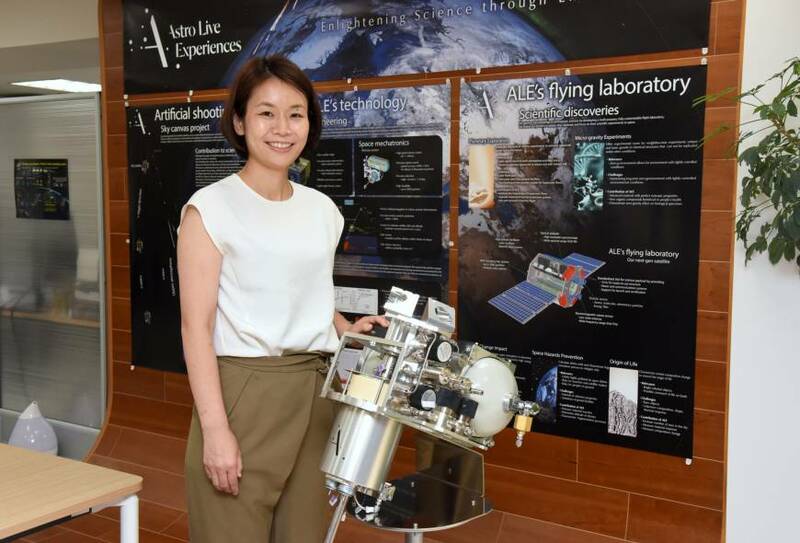 ALE’s technology is not only for entertainment: Okajima says it can be used to collect data on the upper atmosphere and explore the origins of natural meteoroids. The service may eventually be available across the world for festivals, concerts and other events calling for fireworks of an astronomical scale. Tweaking the coordinates of the satellites and the trajectory of the pellets will, in theory, enable ALE to produce shooting stars anywhere on the globe. Okajima imagines that something akin to an online reservation system may eventually be created, where interested parties can book available time and location slots for meteor showers. ALE, which stands for Astro Live Experiences, claims events can also be viewed by spectators across a wide expanse. The planned Hiroshima event, for example, is expected to be visible on the ground from an area around 200 km in diameter, allowing people in other prefectures of the Setouchi region to enjoy the show. Okajima says ALE chose Hiroshima for its premiere due to its international name recognition and good weather, an important factor to ensure visibility. The company is already being contacted by event operators and city promoters interested in buying meteor showers, which brings up the question of pricing. ALE has so far raised ¥700 million from angel investors and counts Japan Airlines and convenience store chain FamilyMart as official sponsors. Still, the project is reportedly costing something in the neighborhood of ¥2 billion to realize. While Okajima says ALE hasn’t decided on a figure yet, she estimates that in the future a single show could be slightly cheaper than a fireworks festival, which typically cost up to tens of millions of yen depending on scale. The intricate set of conditions that need to be fulfilled for the project to deliver the expected results means there’s very little room for error. Even rocket launches aren’t 100 percent reliable — of the 91 worldwide launch attempts to orbit during 2017, 8 were classed as total or partial failures, according to the Seradata SpaceTrak database. That translates to a failure rate of around 8.8 percent. 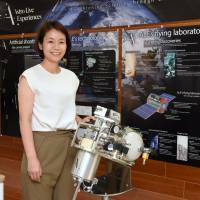 But once her satellites are successfully launched into space, Okajima is confident the years of work her team has invested in her dream will deliver Earthlings a one-of-a-kind nighttime extravaganza. “There’s always the chance it won’t work,” she says. This section runs exclusive stories on startup founders with unique business models interviewed by The Japan Times. space, Hiroshima, startups, satellites, shooting stars, Ale Co.